As luck would have it, British high-street chain Topshop carries a number of dresses for the 5'7" and over set as part of their Tall Collection. 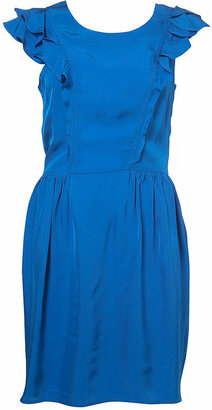 Most options are under $100, like this stunning sapphire-blue number which costs $80 at Topshop.com. There's no added sales tax when you shop online and shipping is a $15 flat rate. Love 21 is Forever 21's answer to the many budget shoppers looking for more sophisticated, modest clothing with misses sizing as opposed to juniors. Longer hemlines make this collection work for ladies on the tall side, too, as seen here with this floral resort dress, just $22.80 at Forever21.com. Many stylish ladies blessed with height swear by Banana Republic's tall offerings for dresses, suits and much more. At $132, the gorgeous dress shown here isn't exactly cheap but you can always stalk the sales and shop the outlets. There's no excuse not to buy BR especially when you consider the quality and overall value. Slowly but surely, JCPenney's American Living Collection has been winning me over (I was apprehensive about the prices at first, but they always come through with their sales + coupons.) Take, for example, this sundress: The cut is classic, the nautical print is unbelievably chic and it's on sale for just $39.99 down from $90. And tall lasses take note: The hemline is longer, meaning you can wear this dress with confidence. We heart them for their shoes, and lately I'm loving Nine West for their growing selection of very wearable, very adorable and very affordable dresses. The cuts are more modest than a lot of what's out there, which means you're more likely to have luck with this brand if you're on the tall side. Ladies of all sizes will want to wear these dresses to the office, to weddings, baby showers—you name it. Most styles cost less than $100 and you can find them at Macy's, Lord & Taylor and online at NineWest.com. OK, ladies: What did I miss? 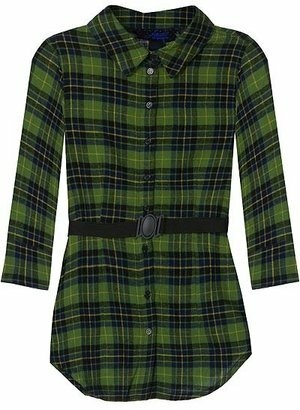 Here's a great plaid shirt by BB Dakota with flattering 3/4-length sleeves and a nipped waist in a soothing forest green hue, just $44 at chickdowntown.com. You can wear it now layered over a tank with shorts, then again in the fall with jeans and boots. Need another option? This buffalo plaid shirt is one of the cuter items I spotted in the newly released Miley Cyrus & Max Azria clothing line for Walmart. Keep in mind the sizing is juniors, but I think this top would work for many ages. It's just $12 and also comes in red plaid or purple plaid. Check out the rest of the collection here, especially if you're in back-to-school shopping mode. Here's a great wardrobe essential that you can wear now and into the fall: It's a classic pencil skirt by Juicy Couture with an Herve Leger twist, and it can be yours for $138. Why invest in an investment piece if you don't have to? 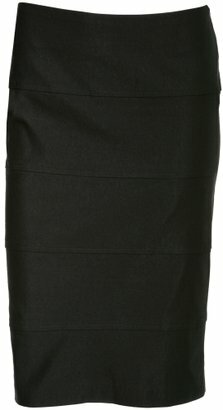 Save on this office-to-evening bandage skirt from Charlotte Russe for the low price of just $19.99.